1. Cut the beef into small cubes, mix with the seasoning and set aside. Chop the onion and peppers. 2. Heat the oil in a large frying pan and cook the beef, onion and peppers for 5-8 minutes until softened and golden. 3. 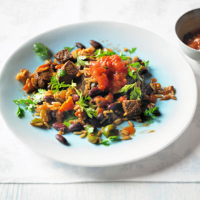 Drain and rinse the kidney beans, add to the beef mixture in the pan with the rice and 100ml water. Cook for 5 minutes, stirring regularly, until piping hot. 4. Stir through most of the coriander leaves, divide among bowls and top each with the remaining coriander. Serve with some Waitrose vine-ripened salsa, if liked.